Price Around $25 (For latest discounts and prices). 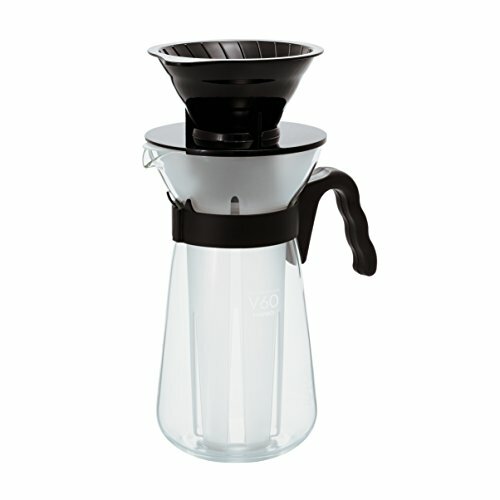 For anyone familiar with the V60 (or pour over) brewing method, the VIC-02B is the same concept, except it can be used to make iced coffee. This means that the result isn’t strictly cold brew (in which the hot water never comes into contact with the coffee). However, the VIC-02B is simple to use and quickly produces a great iced coffee with minimal hassle. 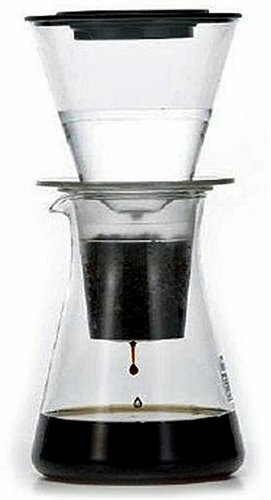 For pour over, aim for a total brewing time of around three minutes, including the time it takes the water to finish dripping after you’ve stopped pouring. All of this might sound a little complicated, but it’s not. All you’re doing is pouring hot water over coffee and ice. Experiment with different coffees and brew times to find the best combination for you. Once the brewing has completed, you can remove the filter and ice holders, put the lid on the carafe and use it as a handy pouring jug. 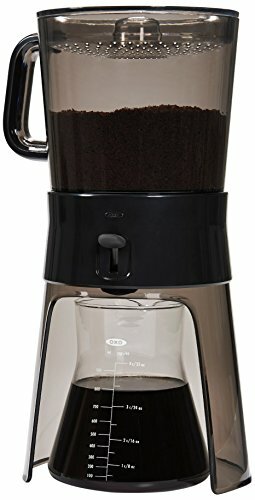 If your current method of making iced coffee at home is brewing a regular cup of coffee and leaving it in the fridge overnight, it’s certainly worth considering spending $25 (or less) on the VIC-02B. As a bonus, if you remove the ice holder, you can use it to make hot coffee too – simply use the same brewing method, minus the ice. If you’re looking for a speedy iced coffee brewing method, you could also try the HyperChiller Iced Coffee Maker. At this point you might be wondering if we’ve slipped in a typo, but, no, it does take up to a full day to make your cold brew coffee. For anyone unfamiliar with the cold brew process, you add cold (or room temperature) water to coarse ground coffee and let it sit for up to a day to release the aromatic flavors. The result is a less acidic and bitter beverage. In fact, the process produces a coffee concentrate, which you can then combine with cold water to make your cold brew beverage. You can also mix the concentrate with hot water or milk if you prefer. The concentrate can be stored in the fridge for up to two weeks. Go away and amuse yourself for 12 to 24 hours while the coffee brews! Overall, OXO has done a great job making the Good Grips easy to use and clean. There are also nifty features, such as the auto-stop which prevents the coffee concentrate filtering out when the carafe is removed (so no flooded kitchen!). You can also stop the draining process mid-way through and restart it when you’re ready, allowing you to use some concentrate before it has all drained out. As you might have guessed, it takes a bit of time and effort to make cold brew. However, OXO has put a lot of work into creating a versatile machine that takes the hassle out of the cold brewing process. If you’ve got your heart set on producing the flavor of cold brew at home, the Good Grips is certainly worth a look. A slightly cheaper, a non-electric option is a longtime favorite, the Toddy T2N Cold Brew System. We finish with something a little special. The Yama is a showstopper that produces iced coffee using yet another method. This time we’re talking cold drip. This is a relatively uncommon way of producing iced coffee, involving dripping cold water through ground coffee resulting in a strong brew. With this method, you don’t get a concentrate to dilute. You can drink the coffee as it comes out, or poured over ice. The Yama can also be used to make tea. Overall, this is a unique, but rather unwieldy, brewer/piece of artwork that would look awesome as the centerpiece on the table at a dinner party or sitting on the counter at a coffee shop (there are both 32oz and 124oz versions for home or commercial use). The coffee it produces is terrific, as long as you use a quality bean and pay attention to the drip time. If this were a beauty contest, the Yama would win hands-down. Fortunately, this pricey piece of coffee art also does the job when it comes to producing strong cold drip coffee. Of course, whether you want to splash out upwards of $250 for the ability to make cold coffee at home is up to you. 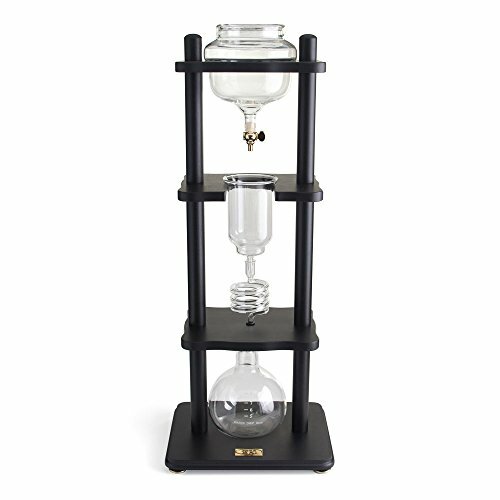 If you fancy trying cold drip at a friendlier price, take a look at the Iwaki Water Drip.